I get on a plane early tomorrow morning, and I am very excited about it. One of the main goals of the workshop is to complete a finished illustration under the guidance of the instructors. We were given a list of 6 assignments to choose from, ranging from sample magic cards to a paranormal romance book cover. After carefully reading all the options it took me about 0.5 seconds to choose Joan of Arc. It fits in too perfectly with what I like to paint. Above is my rather obnoxiously detailed sketch. I have to get it through a round of critiques by the industries top dogs before I can paint it, so we will see what the final image actually ends up looking like. I will, of course, be posting the final when I get back... stay tuned. I have 2 questions one is the master class every year because since its so short notice and i live in Florida i need a good chunk of change b4 i can sign up? 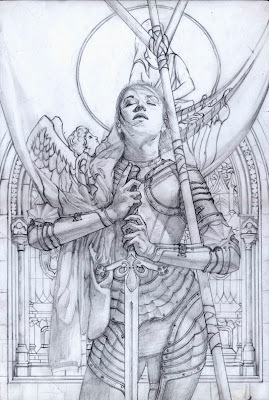 Second questions is that i know Donato Giancola paints on paper then mounts on board as well and i was wondering if possible since you comfortable with this media if you can have a visual step by step from getting a simple idea onto a board and all that ty for reading? yeah, they do the masterclass every year. you can do a payment plan to sign up, all the info is on the website. Donato has a step by step on mounting paper to board on his site. I plan to do a step by step video of it soon.